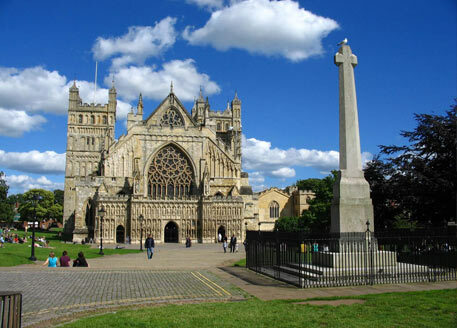 Exeter is a city situated in the coastal area of Devon on the River Exe with a population of over 100,000. The city was heavily bombed during the Second World War, and in the 1950s the city was rebuilt. Most of the city’s historical buildings were heavily bomb damaged and unable to salvage all except Exeter Cathedral which although damaged was restored back to its former glory. Exeter provides employment; services and shopping for the local residents within the city limits and surrounding areas and around 35,000 people commute to Exeter on a daily basis. Exeter has been identified in the top ten most profitable locations for business to be based. The Met Office – the main weather forecasting organisation for the UK relocated to Exeter from Berkshire in 2004 and is one of three largest employers in the area. Exeter has a number of tourist attractions, although the city is not dominated by tourism, employment from tourism is only 7%. The city is expanding at a rapid rate with a new Science Park at Redhayes, Intermodal Freight Depot and Skypark (Business Park) situated next to the airport. The new town of Cranbrook is being developed. St Nicholas Priory a former monastery owned by the local council and is now a museum. There are a number of medieval churches and the third oldest Synagogue in Britain built in 1763 The Exeter Synagogue is in the city centre. There are many ruins, galleries, theatres, gardens and parks to explore around the city. Exeter has an excellent public transport service, local buses that serve the city and surrounding areas. With Stagecoach South West and Western Greyhound for journey’s further afield. The busy High Street is pedestrianised except for bicycles and buses. St David’s railway station provides a train service to all the major cities such as; Bristol, Birmingham, Leeds, Northern England and Scotland. Exeter International Airport is in the east of the city and provides scheduled and charter flights. The city has excellent education facilities; The University of Exeter, Exeter College of Further Education and St Love’s School of Health Studies. The city has 25 primary schools, five secondary schools, three special schools, and schools for the deaf and partially sighted. Exeter has a professional football club ‘Exeter City’ who are currently in league two. Exeter has a rugby team, cricket team, rowing club, squash club and speedway team. Exeter is a thriving city with a lot to offer and therefore is an ideal opportunity for property investment in Exeter in the buy to let property market.